Barker Returns To "The Price Is Right"
Bob Barker returned to "The Price Is Right" - and this time he was the showcase. After nearly two years in retirement, the 85-year-old former game show host was invited to come on down to "The Price Is Right" to promote his upcoming memoir, "Priceless Memories," due out April 6. Barker on Wednesday once again stood on the set where he had worked for 35 years. As he walked the halls of the studio, old co-workers greeted Barker with broad smiles, seemingly as happy to have him back as he was to be there. 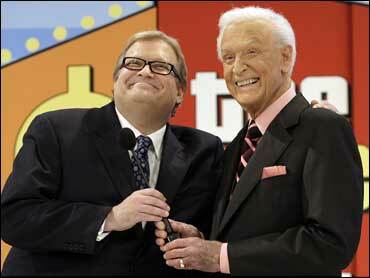 Dressed in a black suit with a hot pink shirt and matching tie, the silver-haired host appeared alongside successor Drew Carey near the finale of the show, which airs April 16, to present two prize showcases that were somewhat stretched to promote Barker's memoir. One showcase, for example, featured a computer to order the book, a trip to New York City to buy a bundle of the books from the publisher, and a truck to haul them all back in. "That general idea was in their script, but I shamelessly overacted on a lot of it," Barker said, laughing mischievously in his dressing room after the show. All 300 members of the show's live studio audience also received a copy of the tome. Most days, Barker said his retirement has been filled with various projects helping animals. He also keeps in shape by exercising with light weights and an elliptical machine. "I have remarked that I better go back and start doing the show again to get a little rest," Barker said. But despite his busy lifestyle, the veteran performer said he misses the excitement of "The Price is Right." "I could never have done this show if I hadn't enjoyed it, and one of the things I enjoyed was the excitement with the audience, the fun with the audience, the responses of the audience," Barker said. "I'd done audience participation my entire adult life." Barker taped his last regular episode - his 6,586th - of the popular CBS game show in June 2007, retiring after five decades on national television. Always the animal lover, Barker spends his free time with his dog, Jesse, and two rabbits, Mr. Rabbit and Honey Bunny. Proceeds from Barker's book will go to the DJ&T Foundation, which he founded in 1994 to subsidize the cost of spaying and neutering animals. Asked at the end of the interview if there was anything else he'd like to add, Barker chuckled and said, just as he had for 35 years on network television: "Help control the pet population, have your pets spayed or neutered."